[0:49] <Nikon> so, quick question, I can't run a regular 32bit .run on my pi can I? [0:52] <shiftplusone> You mean x86? [1:17] <Nikon> can i submit a package to rasbian? [1:20] <plugwash> Nikon, what kind of package are we talking about here? [1:23] <rikkib> Where to next... Have MC9S08 talking to nRF24 and set up as a PRX (Receiver). I think next is a ping pong test between a RPi and the S08. [4:58] <evilgarb1getruck> anyone know anything about getting the camera module shutter speed over 0.8s? [5:56] <olalonde> hi all. I don't have a hdmi monitor.. is there a distribution that automatically starts ssh server? [6:02] <Taylor> olalonde: I believe all latest revisions do? [12:23] <tigerden> Is there any way we can use the mic provided with most headphones and earphones? [12:36] <pksato> tigerden: use these cheap usb ($3) sound card, or RPi sound borad ($33). To get mic input. [12:49] <zamba> i have a question about how to use the pi to make sure its lifetime is maximized.. we want to use the pi as a monitoring proxy for zabbix.. should be be using an usb key as well? [12:50] <tigerden> How to use Raspberry Pi as an irc server?? [13:00] <tigerden> Is it same as quassel-core? [13:52] <olalonde> will I have to buy a monitor / keyboard to debug this? [13:55] <olalonde> maybe there was a problem when setting up the SD card? [15:42] <olalonde> how can i troubleshoot this problem? [15:47] <MarcN> olalonde, did you check the md5sum of the imge you downloaded? Win or Lin to create the SD card? [15:47] <olalonde> i will check the md5sum but shouldnt it be fine if i donwloaded via bittorrent? [15:47] <MarcN> olalonde, don't know. I don't torrent. which distro? [15:49] <MarcN> olalonde, worked for me ;-) I'd guess something wrong with how you wrote it to the card. Didn't finish writing before taking out? [15:51] <olalonde> "sudo dd bs=1m if=2014-01-07-wheezy-raspbian.img of=/dev/disk2"
[15:53] <olalonde> is there a log somewhere that can help me figure out what might be the problem? [16:07] <Zylinx> http://www.ebay.co.uk/itm/390568254400 can i run this directly off of the Pi ? it wants 5v 20mA per relay and there are eight. iv heard that the Pi's GPIO can only supply 3.3V ? so does this mean i would need something inbetwene ? [16:08] <IT_Sean> Zylinx: yes, you would need a wad of electronics inbetween. [16:09] <Zylinx> IT_Sean do you have any suggestions ? would this help me: http://www.fort777.co.za/images/Datasheets/SEN95H.pdf ? [16:11] <Zylinx> IT_Sean, and by wad do you mean an unconventional amount ? [16:12] <nid0> olalonde - do you have anything plugged into gpio? [16:19] <Zylinx> does anybody else here have experience with GPIO ? [16:27] <Zylinx> dblessing, do you have experience with this stuff ? [16:48] <ghallberg> hello, my raspberry can't run fsck.ext4 when booting, it throws an "exec format"-error and drops me too a prompt. Anyone had this issue and solved it or should I just wipe the SD-card and start over? [16:49] <ghallberg> Daemons start booting and everything seems fine until the fsck-kicks off. [16:49] <ghallberg> The filesystem is fine when checked on another computer. [17:46] <ghallberg> /dev/disk doesn't exist at all. [17:47] <IT_Sean> does the pi boot? [17:50] <ghallberg> I'm really confused by these two errors, it's not affecting normal operations once I worked around them. [18:01] <Zylinx> IT_Sean, how sure were you about saying i need electronics in betwene ? [18:03] <ghallberg> I wonder where I an get a more powerful PSU for my router, I want to drive a Pi from the USB-port but it seems to be too weak. [18:59] <Zylinx> is there a tool to check an SD card for any problems ? [19:06] <Laseryoda> Hey, will this adapter work for a RPI model b? [19:07] <Laseryoda> pksato: i read somewhere that anything over 1.2A will break it? [19:08] <IT_Sean> that's not true, Laseryoda. [19:08] <IT_Sean> It simply won't be able to USE all of that. 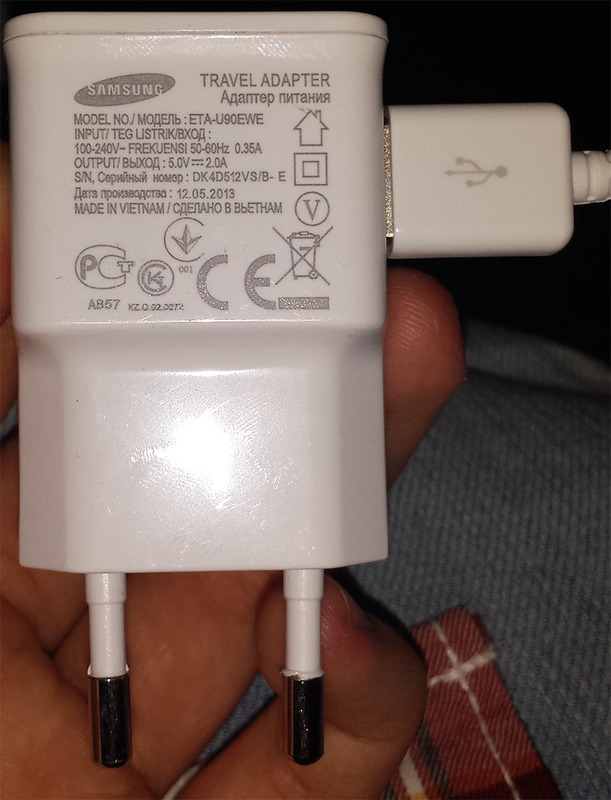 That said, it is perfectly safe to use a 2a or even 3a adapter. [19:08] <Zylinx> my raspberry pi keeps rebooting while running XBMC :/ and i know power supply is the first place to go but my DMM got stolen last week. so until i get a new one, is there anything else i can easily check ? [19:08] <IT_Sean> That sounds like the power supply. [19:09] <Zylinx> but yes i will definatly check it out as soon as i can, but just to save time is there anything else i can check in the mean while ? [19:10] <pksato> problem, is that PSU label not away reflect the real power rating. [19:10] <IT_Sean> Zylinx: if your raspi is rebooting, the first thing to check is the power supply. That is the most likely issue. [19:10] <pksato> also. replace USB cable. [19:11] <Zylinx> high resistance ? [19:12] <IT_Sean> you can check whatever you want... you can check that evil fairies aren't unplugging it if you want to... doesn't change the fact that the problem is most likely the power supply. [19:12] <pksato> prefer short cables. like 20cm. [19:30] <shiftplusone> in practice it might, but it's certainly going out of spec. [19:30] <IT_Sean> Zylinx: the addressable GPIO pins are 3.3v, which is what you asked. [19:30] <IT_Sean> So before you tell me I am wrong, look again at your question. [19:57] <toketin> Hi guys, i'm Italian and i would like to sell my Cubieboard 1 or change it in favour of a Raspberry Pi B, 512MB. [20:04] <[Saint]> toketin: Why on Earth would you want to do such a thing? [20:05] <[Saint]> It may be lost in translation, but I would refer to doing such a thing as "shooting yourself in the foot". [20:06] <[Saint]> Well...FWIW, the pi *also* has a closed driver. [20:07] <toketin> and broadcom hasn't released some time ago the GPU drivers? [20:07] <[Saint]> They released an open shim to interface with a closed blob. [20:08] <[Saint]> But many people misunderstood this and saw it as "open drivers". [20:09] <[Saint]> I would just buy a raspi and keep the cubieboard. [20:09] <[Saint]> The resale value of the cubieboard is next to nothing. [20:11] <[Saint]> I sincerely doubt that you won't find a use for the extra board. [20:11] <shiftplusone> toketin, are you asking about the drivers released like a year ago or like a week ago? [20:11] <[Saint]> Oh, right. Yes. How forgetful I am. [20:12] <[Saint]> Though, the recent release is good *in theory*, its not anything /yet/. [20:12] <shiftplusone> toketin, the 'shim' Saint is talking about is old news. They have recently released proper documentation for the GPU. [20:14] <shiftplusone> [Saint], Gordon and Eben did say they want to get an open blob out and have said to watch the front page for that sort of thing. [20:15] <[Saint]> I'll keep my fingers crossed, but I'm not overly hopeful. [20:15] <[Saint]> I'm mainly interested in removing the silly boot restrictions. [20:16] <shiftplusone> silly boot restrictions? [20:16] <[Saint]> "having to boot from FAT32 /boot partition on sdcard"
[20:17] <[Saint]> It *could*, in theory. [20:17] <shiftplusone> It works fairly well, so I don't think there's much of a demand for a different bootrom to be burned in. [20:18] <[Saint]> sdcard is the main failure point of these devices. [20:20] <shiftplusone> at least it will solve a significant portion of those issues. I guess there are still cards which won't work because of their firmware and maybe timing issues. [20:21] <[Saint]> Onboard storage that enumerates as generic storage when connected to a USB host would be awesome. [20:21] <[Saint]> Fingers crossed for that on Raspi Mk 2. [20:22] <[Saint]> I didn't just mean that the sdcard slot is physically unreliable, also. [20:23] <[Saint]> I meant that sd is an unreliable platform for storage full stop. [20:23] <[Saint]> On the pi, it seems particularly so. [20:24] <[Saint]> Unreliable for storing *important* things, that is. [20:24] <[Saint]> Its fine for storing photos and whatnot on your phone that are almost certainly backed up to cloud storage also. [20:25] <[Saint]> As an storage medium for an operating system? Yeah...nah. [20:25] <[Saint]> Surely you've had it thrash the data thereon at least once? [20:26] <shiftplusone> never, not even when resetting the pi without rebooting. [20:26] <shiftplusone> And any on-board solution would still be based on the same technology as sd cards and suffer from the same problems, wouldn't it? [20:27] <[Saint]> It *could*, sure. But it needn't have to. [20:27] <shiftplusone> The reliability would scale with price though, no? I suspect anything reliable would be outside of the sensible price range. [20:28] <shiftplusone> kind of like the USB/NIC chip 'works'.... but it's not all that great. [20:28] <[Saint]> You could put 512MB~1GB on it for a few bucks extra. [20:29] <shiftplusone> too much of a headache for them, I reckon. [20:30] <[Saint]> reliance on sdcard was one of the major factors that drove me to the Snowball. [20:30] <shiftplusone> I do wonder what the next pi will be though. Eben did say that if they were still selling the same board next year (I think), that would be catastrophic for them so... hopefuly something is in the works. [20:30] <[Saint]> That, and the awesome price. [20:31] <[Saint]> I would be *mortified* if there wasn't. [20:32] <[Saint]> toketin: have you seen/considered the Snowball? [20:33] <[Saint]> Great, great, great board. [20:35] <IT_Sean> toketin: you can sell your unwanted board on craigslist, ebay, or any number of other marketplaces. [20:35] <[Saint]> In my mind, the type of customer who buys a cubiboard or raspberrypi wouldn't have any problems coming up with a use for a second board. [20:36] <[Saint]> ...or a third. [20:36] <[Saint]> ...or a fourth. [20:36] <toketin> [Saint]: you're right, but why i should keep the second board if unused? [20:37] <[Saint]> If its unused, that's probably just because you're not thinking laterally enough. [20:37] <[Saint]> I guarantee you you could find a use for it. [20:37] <pksato> toketin: you buyed CB1 only for use as media player? [20:37] <[Saint]> I know right? [20:39] <[Saint]> The raspberry pi isn't much (if at all) more performant. [20:39] <pksato> toketin: all ARM board have same issue. [20:40] <[Saint]> And the raspberrypi comes with the "joy" of having /really/ pathetic throughput. [20:40] <[Saint]> That's a major downfall with it, but it was pretty much unavoidable. [20:41] <[Saint]> Push bits through USB? Network flakes. Push bits through network? USB flakes. [20:50] * [Saint] demands more Mooncake on the forum. [20:50] <patchie> hi, i want to use my RPi to stream movies from my linux server online trough VPN. And using XBMC ? will this be possible? [20:51] <sinner> Is this better? [20:56] <[Saint]> Hmmmmmmmm. It just occurred to me that Mooncake should've been the obvious choice for the (now sidelined, or forgotten?) Raspberrypi "mascot". [20:57] <[Saint]> I would've bought the crap out of some Mooncake merchandise. [20:59] <patchie> anyone that has some ideas for me? :) or maybe a solution? [21:00] <[Saint]> You didn't ask for either until now. [21:00] <[Saint]> I didn't think you would appreciate my simple answer of "yes". [21:01] <[Saint]> Is it possible? Yes. Yes it is. [21:29] <Raynerd> good day. I setup an internal web server on the school network today from a pi. [21:29] <Raynerd> I appreciate this is more web than pi specific, but I know v little html or php. Does anyone know where I can find a "nice" simple website template. Header, navigation bar, main menu. [21:32] <Raynerd> lorenzo - many thanks for the google however I wouldn`t be asking if I hadn`t done that. [21:34] <shiftplusone> Raynerd, could you be more specific about why google didn't help you? [21:35] <Raynerd> shiftplusone - sure, just too much dross out there. Downloading messy templates that don`t look nice or are not structured. I have a lovely one at home for my home pi but it is weather orientated. [21:36] <Raynerd> pathie - I have a holding template. [21:37] <Raynerd> I was hoping for something with a nice header, picture, menu..
[21:37] <Raynerd> I don`t want to learn html or php ... I`m good at the moment. This is for functionality. [21:38] <IT_Sean> so, Raynerd, basically you want someone to do all the work for you? [21:38] <Raynerd> shiftplusone - fantastic! [21:41] <Raynerd_> IT_Sean: Yes, correct and I'm not paying a penny. [21:41] <Raynerd> shiftplusone: As usual... You have hit the spot, cheers. [21:43] <shiftplusone> That's great to hear. [21:44] <Raynerd> Haha.. No, they were only allowed on them from last week and a notice went on the bulletin for the first time today. [21:45] <Raynerd> One kid was playing mine craft which I thought was awesome as they had got it up from scratch...!! [21:50] <Raynerd> Anyone used get bootstrap on a pi? [21:51] <shiftplusone> getbootstrap is the site. It's just called bootstrap. [21:51] <shiftplusone> But yeah, I have. [21:53] <Raynerd> Just a little googling mentions having to use googles coder - is that right? [21:53] <Raynerd> Ah, they using coder on the pi as the web server. [21:54] <shiftplusone> that'll work just fine. [21:57] <shiftplusone> but if you do use it, it will not require anything extra on the pi or affect the load on it. [21:58] <Raynerd> Ok. I just want to use a spare pi to host the site you see and I'll put all our pi projects on it, links and our work sheets. [21:59] <Raynerd> Hum, it'll run ok in a pi? [21:59] <shiftplusone> You're going to find maintaining a static page to be a pain. [22:00] <shiftplusone> it will run, yes. [22:02] <shiftplusone> balance that against having to edit HTML by hand every time you want to update the site. [22:02] <shiftplusone> and there are plenty of other CMS platforms, much lighter than wordpress which are worth looking into. [22:03] <Raynerd> Hum, yes, I understand but can't imagine I'll want to edit it too much. And before when everyone was bashing me... I can edit HTML I just need a template to work from. [22:05] <shiftplusone> chances are that these other platforms will allow you to make your own templates, which you can base on bootstrap. But that's probably going to be a bit more work than it's worth. [22:20] <morenoh149> I want to build a walkie talkie device, microphone, speaker one button that can send the recorded audio to twilio. Is the arduino more suited for this? [22:26] <morenoh149> I want to build a walkie talkie device, microphone, speaker one button that can send the recorded audio to twilio. Is the arduino more suited for this? [22:27] <shiftplusone> I don't think anyone came up with an answer since 5 minutes ago. [22:29] <morenoh149> you read it. a penny for your thoughts? [22:41] <morenoh149> meaning I'll need to do what to interface with this microphone? [22:42] <shiftplusone> use an ADC and even then I doubt the sound quality will be any good. [23:42] <Tacker> Hey guys. I have a B model and am trying to connect it to a tv via composite the pi boots, shows me the OS selection screen and after that the tv turns black and nothing happens. I am able to connect via vnc though. [23:43] <shiftplusone> go to recovery and edit config.txt for that OS. [23:44] <shiftplusone> NOOBS is stupid and adds a line which forces HDMI. [23:44] <shiftplusone> there are multiple config.txt files on different partitions. Are you 100% sure you got the right one? [23:54] <rikkib> Much more fun working on small code blocks for small embedded systems... Mind you compile after compile at first to test things. Back to it... Got timer code sorted to provide free running counter at 1/1000000Mhz 1uS period. Radio needs delays. [23:54] <shiftplusone> Tacker, you should have three. [23:55] <Tacker> is that right ?? [23:56] <shiftplusone> from within the OS you are running, yes. [23:56] <Tacker> so where would i find the other config ? [23:58] <shiftplusone> no idea then.